This plain, no frills rack features a durable, black powder coated surface and a solid metal design. 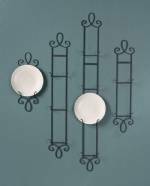 The streamlined look of this rack is perfect for displaying plates without any distracting decoration. Rack measures 3 1/2" wide x 30" high x 1" deep and is perfect for displaying 6" to 7.5" plates. Attractive and affordable!